Rare from the product line. IT IS PURPLE NOT BLUE AS PHOTOS MAKE IT. SOLD AS SEEN. The ipod is in fully working and in good condition (B condition). There is no account linked to any of them. Tap to play your favorite songs. Or entire albums. You can even browse by genres or composers. Wirelessly connect to speakers, headphones, your car stereo, and other Bluetooth-friendly devices. Plays video and FM radio. Apple iPod nano 2nd Generation Blue (4GB) - Good Condition! Fast Del! FOR SALE: iPod Nano 2nd Generation 4GB Blue. Great to hold your music and photos with 4GB you will have a lot of space to do so! Gadgets are tested under a strict policy before being listed, assuring perfect functionality unless otherwise stated. 4.5 out of 5 stars - Apple iPod nano 2nd Generation Blue (4GB) - Good Condition! Fast Del! 37 product ratings37 product ratings - Apple iPod nano 2nd Generation Blue (4GB) - Good Condition! Fast Del! This is a iPod Nano 4GB Black front, silver back. Cash on collection is accepted. Model A1137. IPod nano (4th Gen) 8GB Model A1285 EMC 2287. Includes ipod only, no usb charging cable or earphones. Nice little ipod,perfect for gym or running, Ipod is in excellent codition like new, comes in original box but no charger,however it uses thesame chargers as iphones if you have one. Dispatched with Royal Mail 1st Class signed for. Apple iPod nano 6th Generation Green (8GB). Great little ipod,works perfect,just selling ipod alone no charger. Dispatched with Royal Mail 1st Class. Well-used, but in good overall condition. The paintjob has a couple of chips in it, otherwise it's good as new. Factory reset ready for your use. USB cable provided. Thanks for looking. Apple iPod Nano 8g. Chose language to check everything ok.
For Sale: 1 x Apple iPod nano 7th Generation Slate (16GB) - MD481LL/A. Apple iPod Nano 7th Generation (16GB) Grey. Model MD481LL. 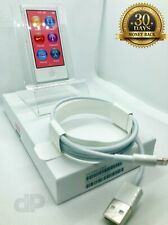 Ipod is in very good condition fully working comes with apple earphones and box. No charging cable sorry. Dispatched with Royal Mail 1st Class. The Apple iPod Nano is a compact music player, with some models offering more advanced functionalities. Discontinued in 2017, the range available was designed over ten years. 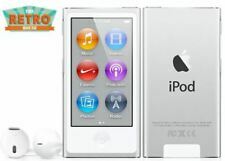 Choose from the original iPod Nano, the compact 6th Gen model or the final iPod Nano 7th Generation. Whatever you're after, you'll find the perfect iPod right here on eBay. The latest, and final, model to be released was the iPod Nano 7th Generation which drew on Apple's latest design features. The large touchscreen lets you watch your favourite shows and music videos with a 240x432p resolution. Choose your 7th Generation iPod in a range of colours, including black, pink or silver. As the thinnest Nano to be designed this model is highly compact and fits easily into your pocket, perfect for listening when on a long work or commute to work. Bluetooth 4.0 connectivity lets you pair your device with wireless speakers or headphones whilst an FM radio tuner lets you listen into your favourite radio stations. Originally released in 2010, the Apple iPod Nano 6th Generation is a big step away from the traditional long handheld design. With a small 1.55-inch multi touch screen you can easily navigate through your playlists and albums whilst enjoying the quality 240x240p resolution. Enjoy up to 24 hours of music playback from this tiny music player, ideal for those longer journeys. The Nike+iPod fitness app helped to track your daily activity in order to help you lead a healthy life whilst the FM radio function let you tune into your favourite stations. Choose from 16 clock faces, including Disney characters, a nixie tube or a traditional analogue watch face. Pair this device with a compatible strap to kit yourself out with a more affordable smartwatch.